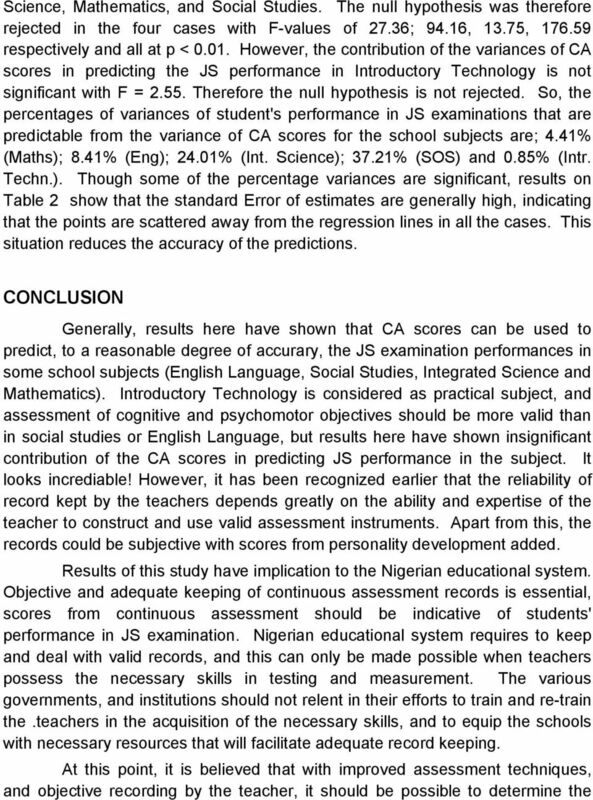 Download "VALIDITY OF CONTINUOUS ASSESSMENT SCORES AS PREDICTORS OF STUDENTS' PERFORMANCE IN JUNIOR SECONDARY EXAMINATIONS IN NIGERIA"
9 performance of the students without a final formal examination which attract major critian for sane time now. Continuous assessment, if properly kept could give a more indicative achievement of a student in terms of cognitive and noncognitive objectives. Continuous assessment presents assessment as part of teaching. Above all, it gives the teachers the opportunity to participate in the final assessment of their products. One of the consequences of this act is that teachers will be ready to introduce innovations that will improve their teaching effectiveness. 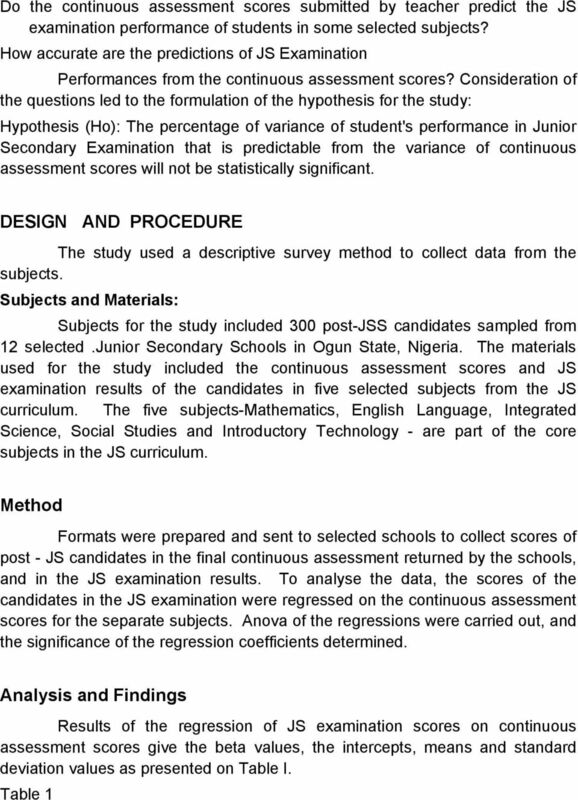 For several years, Nigeria and indeed many West African countries have been plagued with the occurrence of examination leakages and other malpractices especially in West African School Certificate Examinations. Like Falayajo et al. (1984) pointed out, one reason for such a high incidence of examination malpractices could be the fact that the single final and external examination is so crucial in deciding the future of the candidate that the temptation to ensure success by all means is very high. The practice of continuous assessment could be a way of reducing.this temptation since the final examination will constitute a small percentage of the final grade. REFERENCES Bloom, B.S. (Ed.) (1956) Texonomy of Educational Objectives Handbook 1; Cognitive Domain, New York: David Mckay Co. Inc. Ezewu, E. E. & Okoye, N.W. (1981). 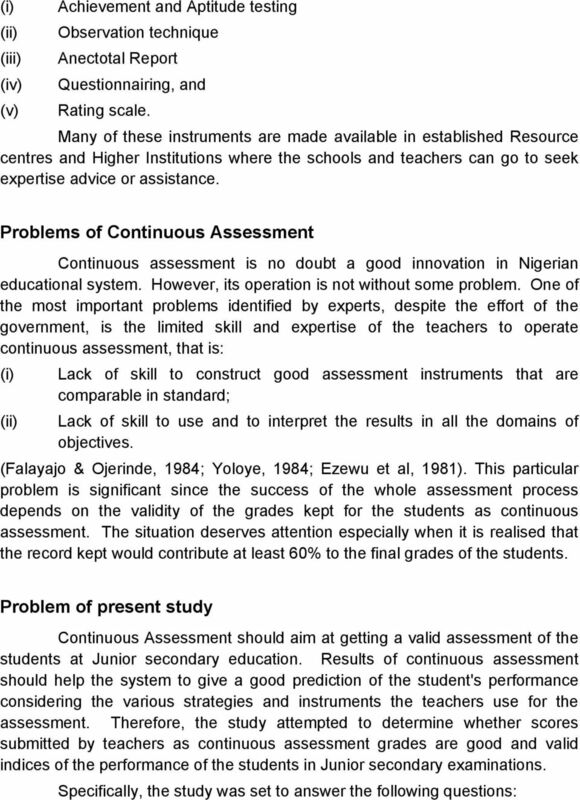 Principles and practice of Continuous Assessment. Ibadan Evans Brothers (Nig) Ltd. Falayajo, Wole & Ojerinde, Dibu (1984) Continuous Assessment. A New Approach Ibadan: University Press Ltd. Federal Ministry of Education (1981) National Policy of Education. Lagos: NERC. Ward, C. (1980) Designing a Scheme of Assessment. London: Stanley Thornes (Pub.) Ltd. Yoloye, E. A. 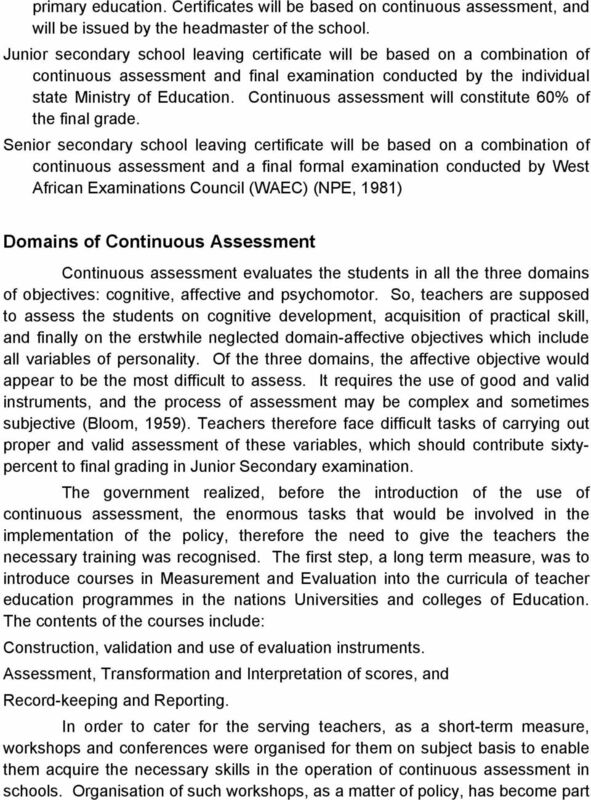 (1984) Continuous Assessment; A Simple guide for teachers. London: Cassell. IMPORTANCE OF RECORD KEEPING IN SCHOOLS BY TAJUDEEN OLANREWAJU IBRAHEEM DEPARTMENT OF PHYSICAL AND HEALTH EDUCATION; UNIVERSITY OF ILORIN. Hypothesis Testing & Data Analysis. Statistics. Descriptive Statistics. 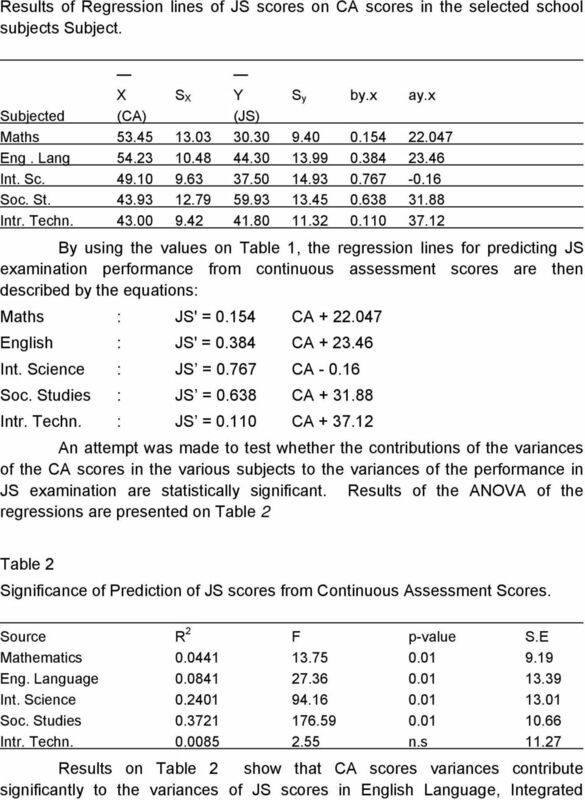 What is the difference between descriptive and inferential statistics? 2 Hypothesis Testing & Data Analysis 5 What is the difference between descriptive and inferential statistics? Statistics 8 Tools to help us understand our data. Makes a complicated mess simple to understand.